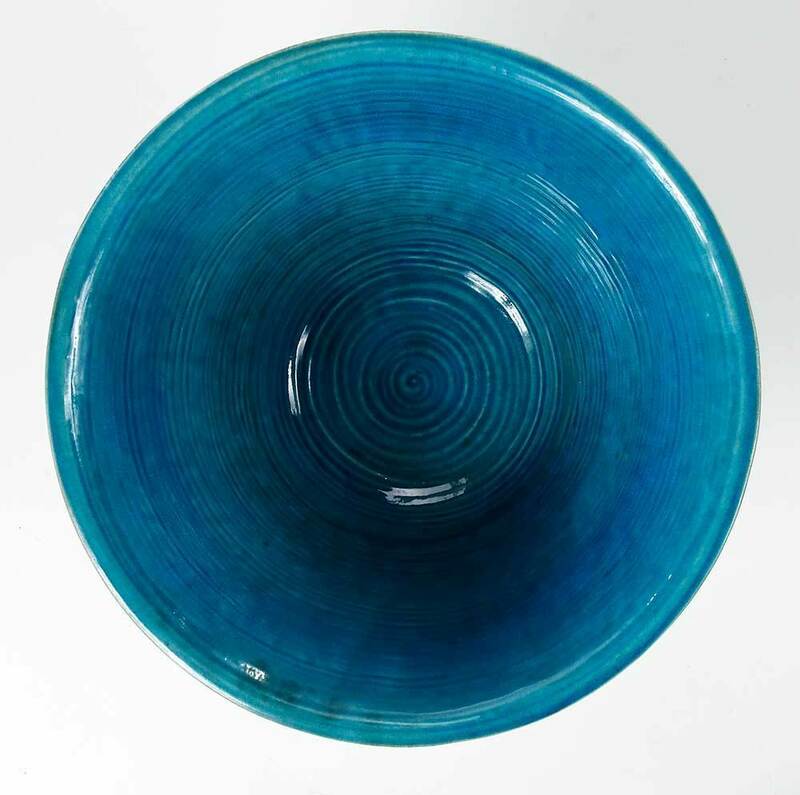 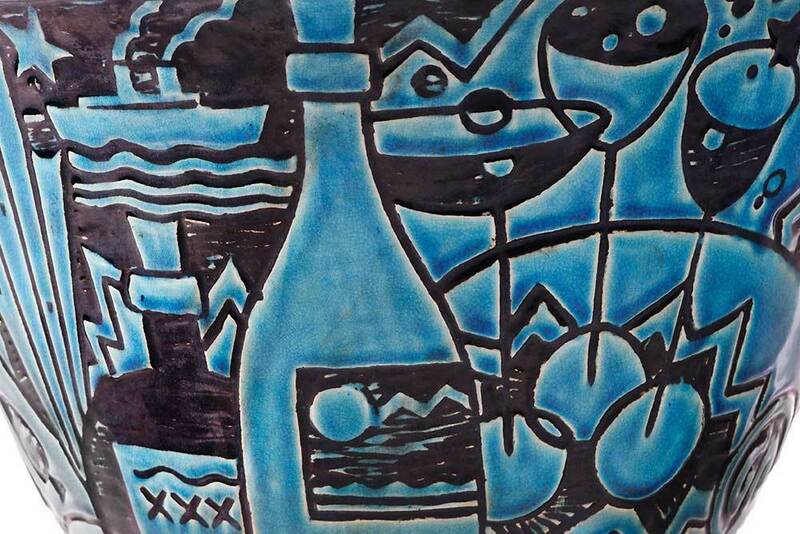 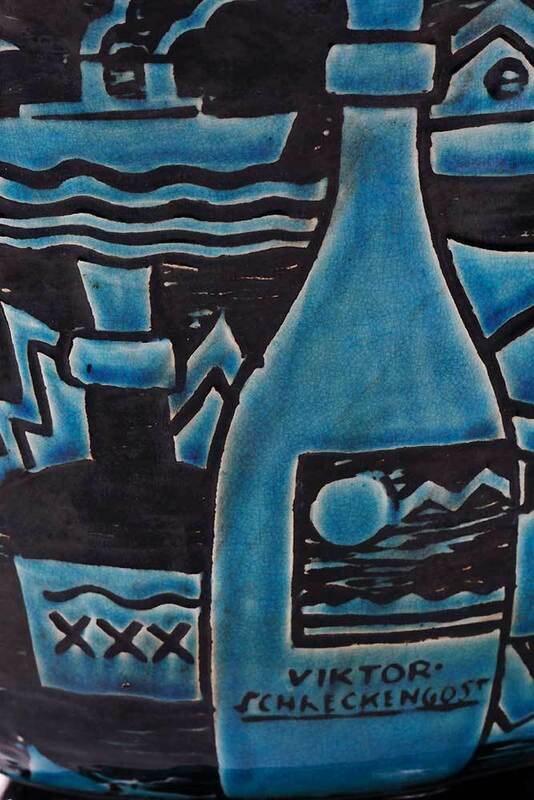 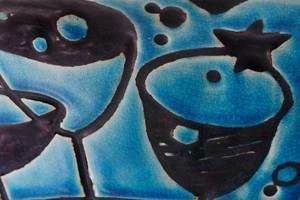 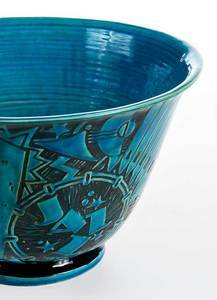 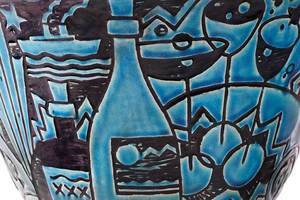 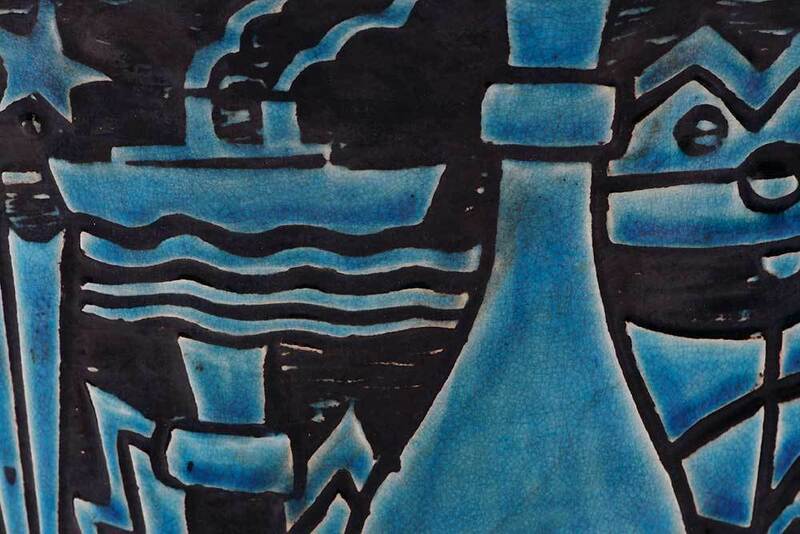 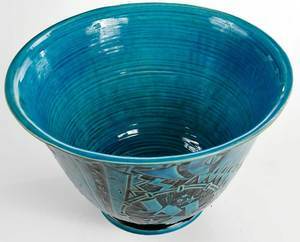 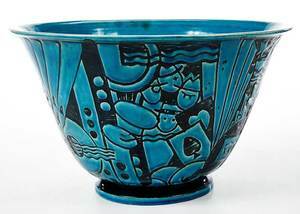 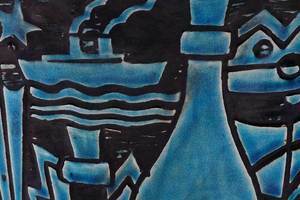 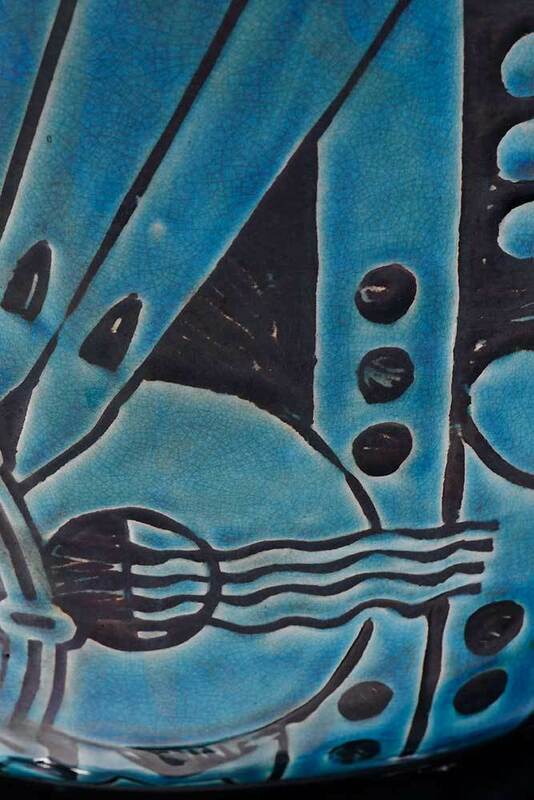 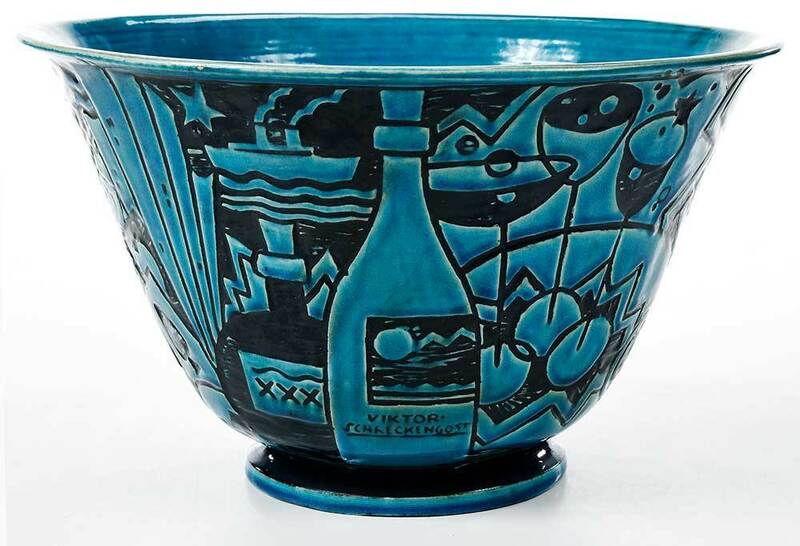 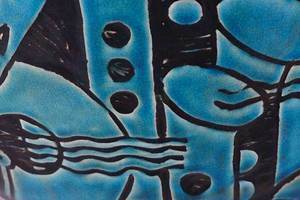 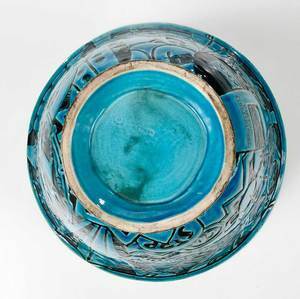 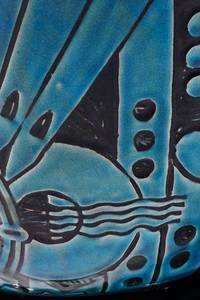 Punch Bowl, from the Jazz Bowl, Series, 1931, signed on 'bottle' "Viktor Schreckengost ", with underglaze stamps for Cowan Pottery Studio, Rocky River, Ohio, form X-38, with flared lip, Egyptian blue glazed porcelain, 8-1/4 x 13-3/4 in. 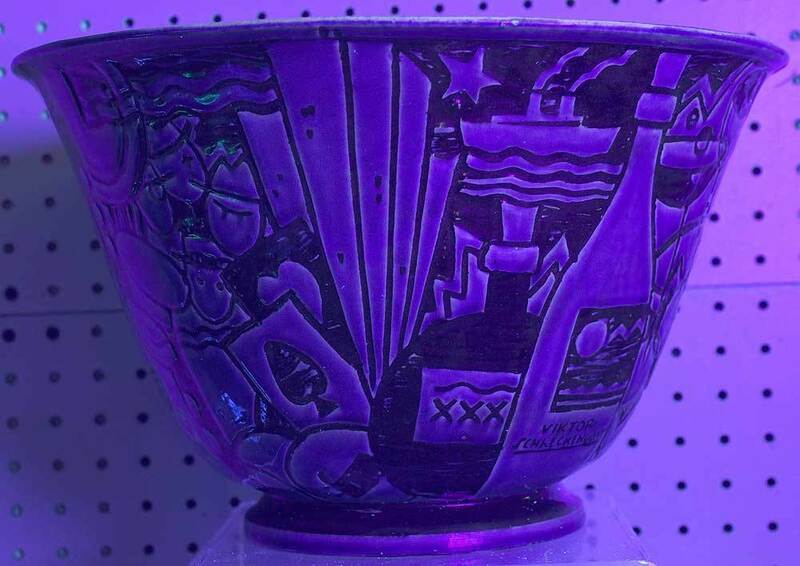 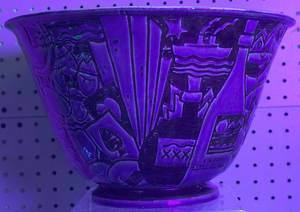 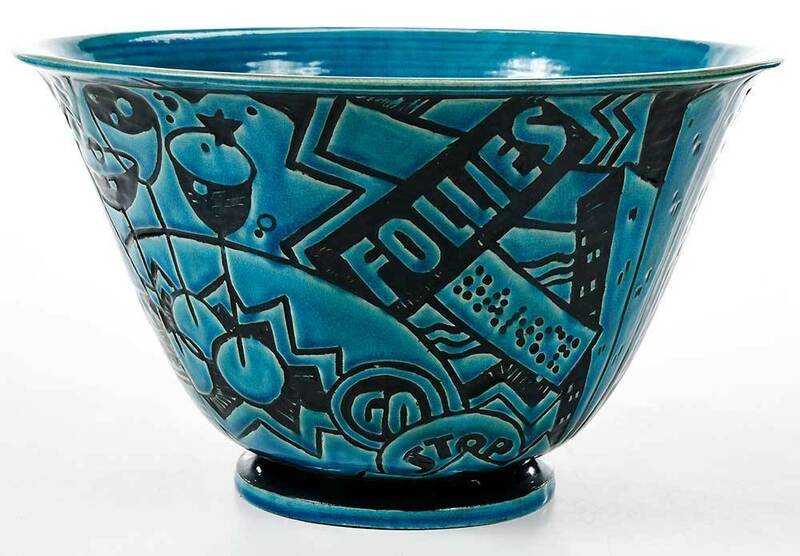 "Requesting something “New Yorkish,” Eleanor Roosevelt commissioned a punch bowl in 1931 for her husband, Franklin D. Roosevelt, then governor of New York. 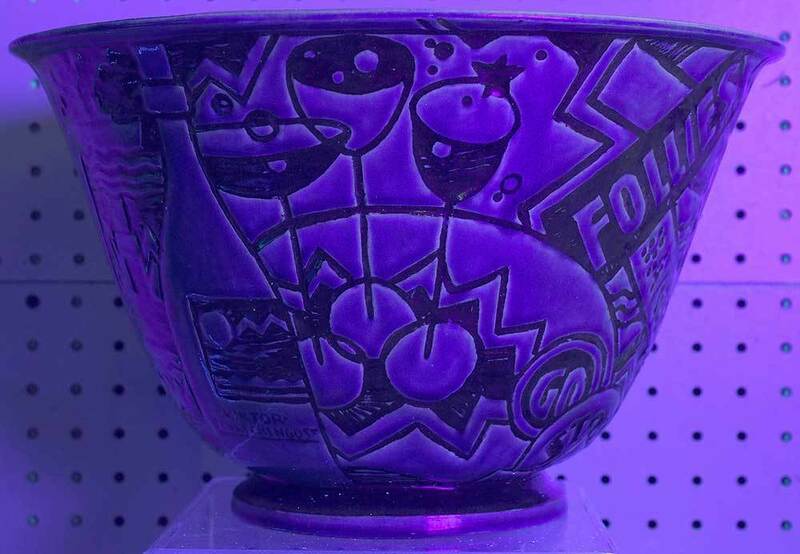 Twenty-six-year-old designer Viktor Schreckengost created a bowl inspired by the New Year’s Eve festivities he had recently enjoyed in the city. 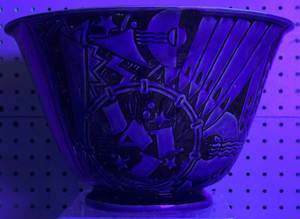 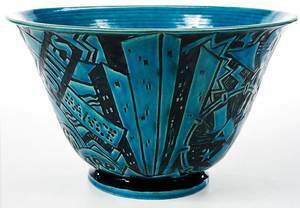 The motifs on the bowl recalled his memories of the brilliant artificial lighting of Broadway and Times Square, jazz music and Radio City Music Hall, illegal cocktails sipped in nightclubs, and the starry night sky glimpsed above looming skyscrapers. 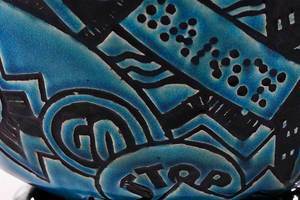 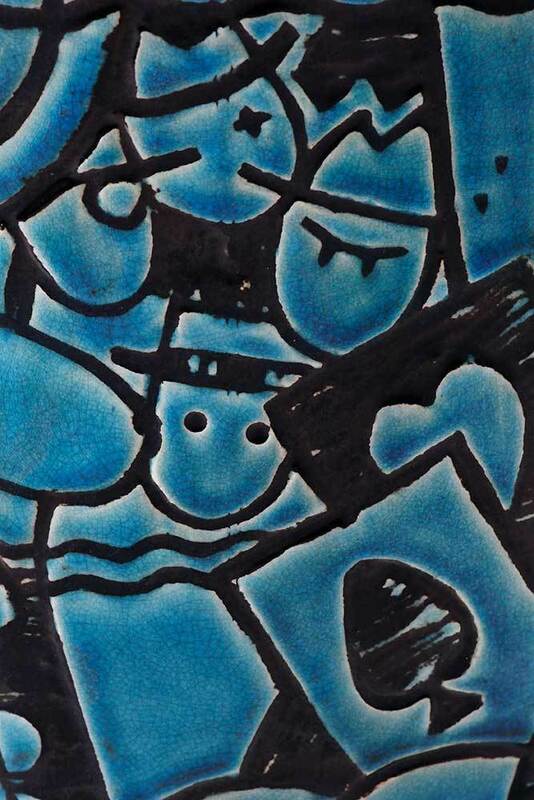 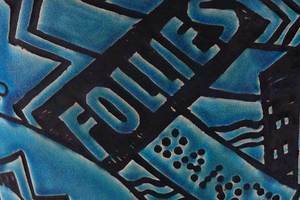 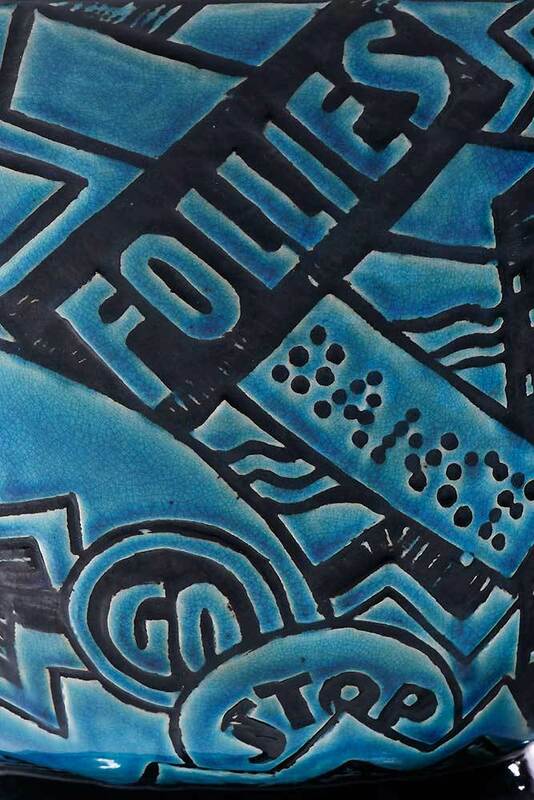 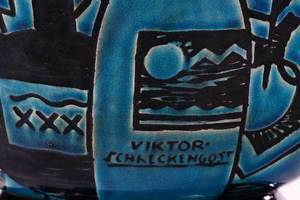 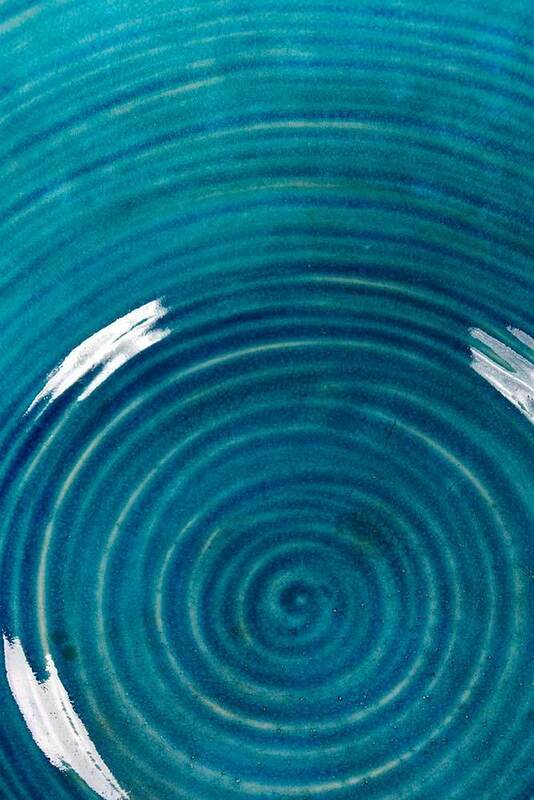 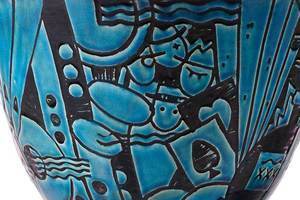 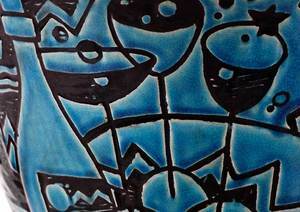 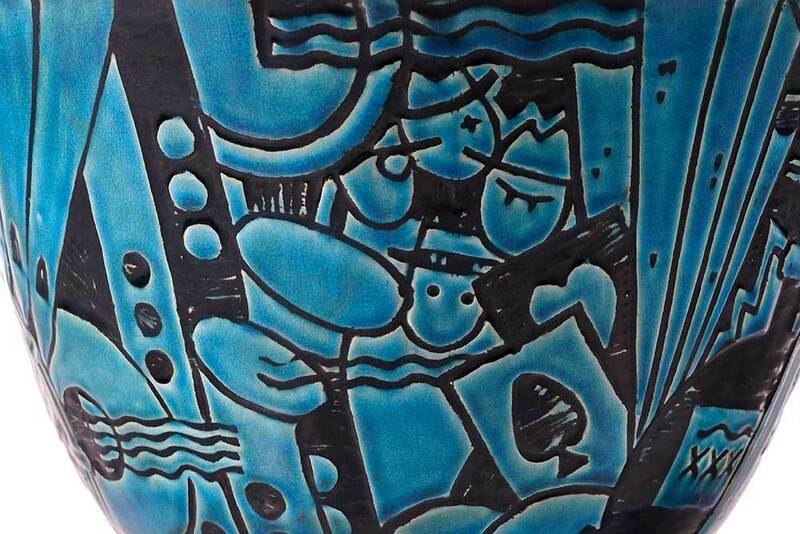 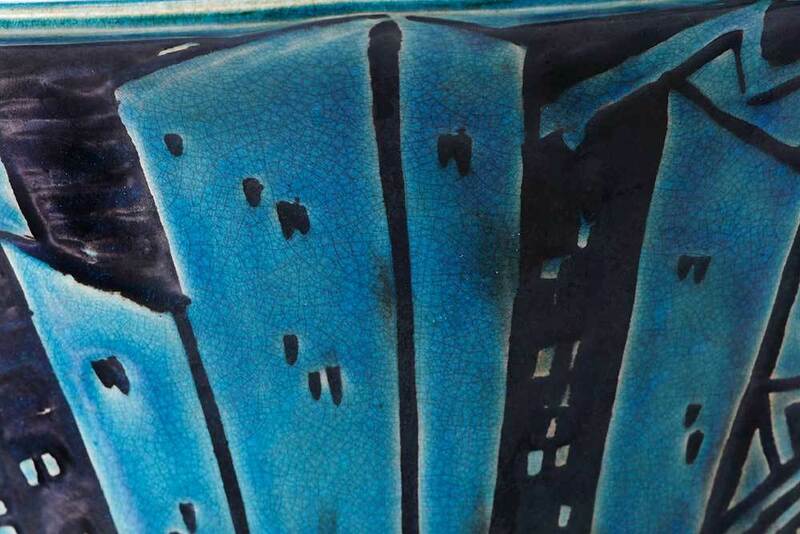 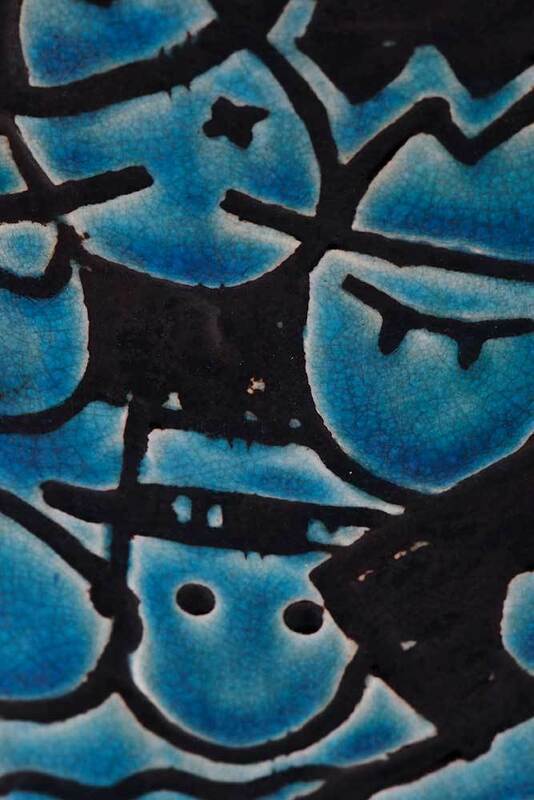 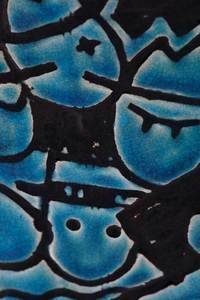 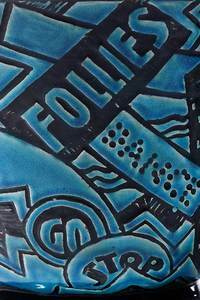 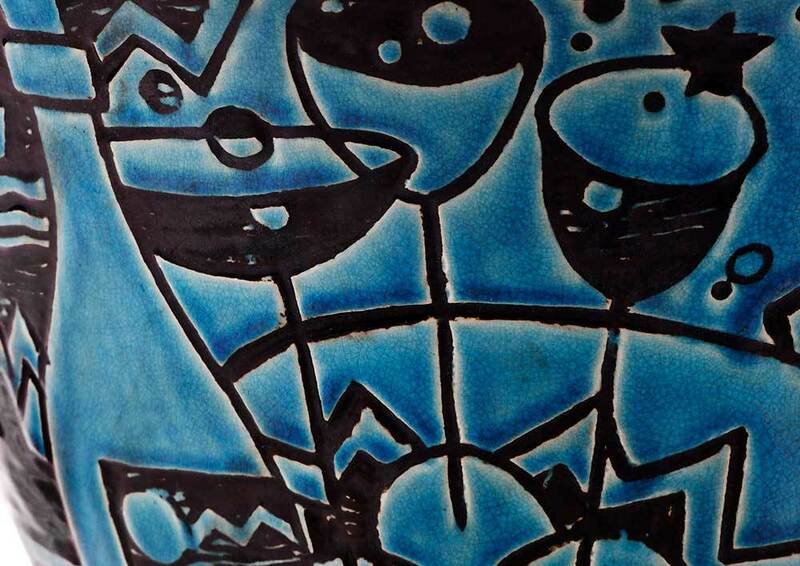 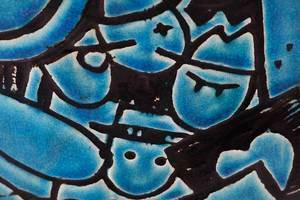 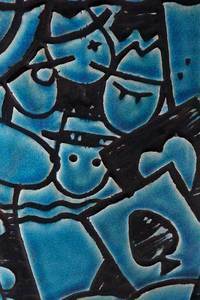 The bowl’s linear design, the playful irregularity of the sgraffito (incised) decoration, and the bold blue and black colors reflected the influence of modern Viennese graphic design and ceramics. Mrs. Roosevelt was so pleased with the bowl that she immediately ordered two more, confident that they would be useful after her husband was elected president in 1932. 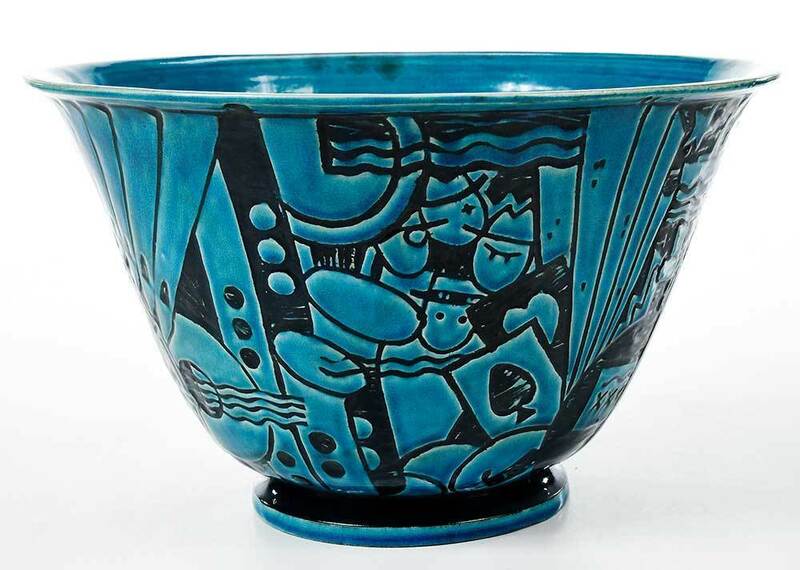 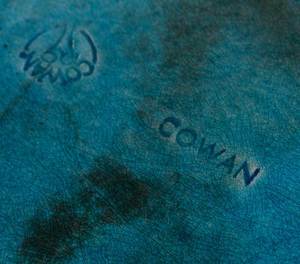 After the design received much acclaim, Cowan Pottery produced a small series of similar bowls, including this one. Manufacture could not keep up with demand, however, because the bowl’s sgraffito decoration had to be done by hand. Although Schreckengost refined the design twice to make the process faster and cheaper, production was still too time consuming and the series was discontinued. 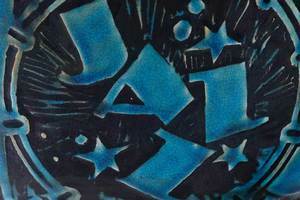 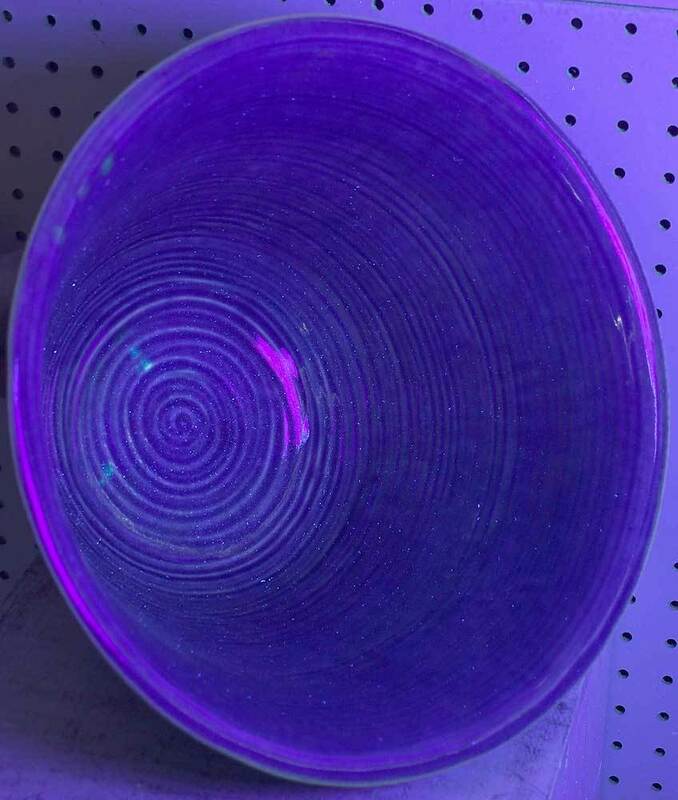 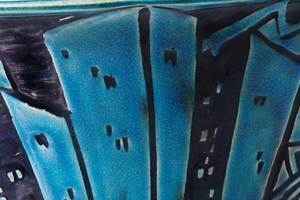 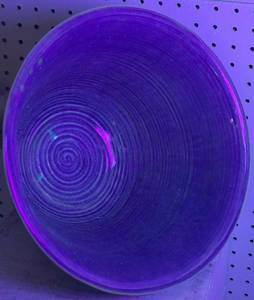 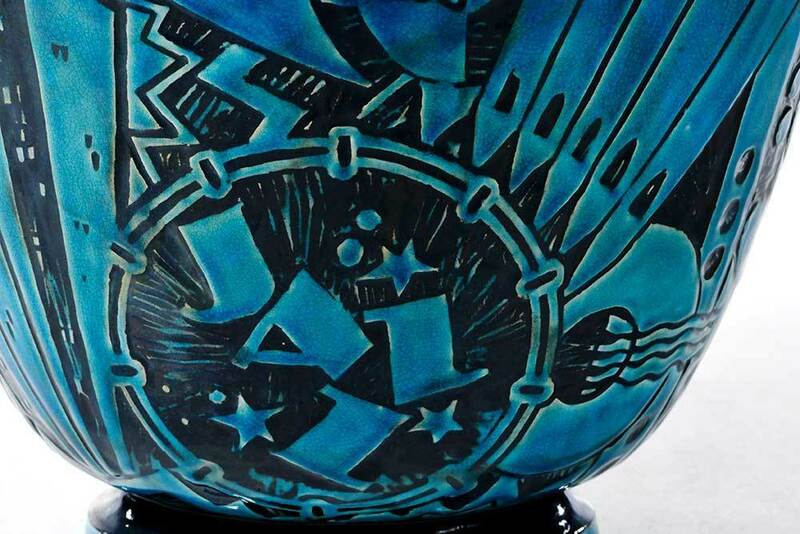 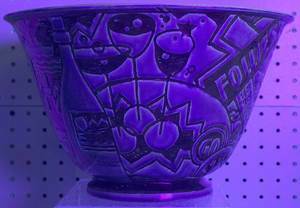 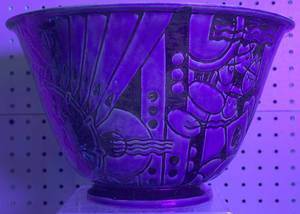 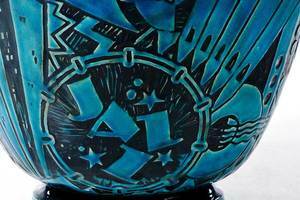 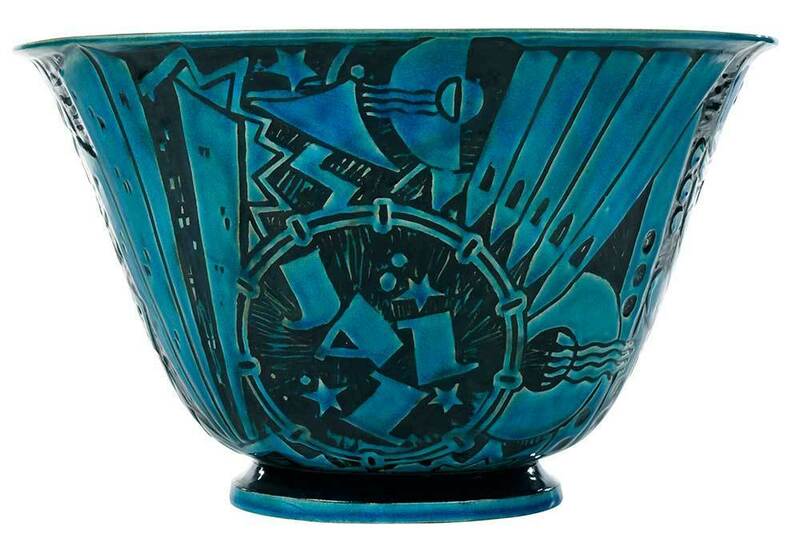 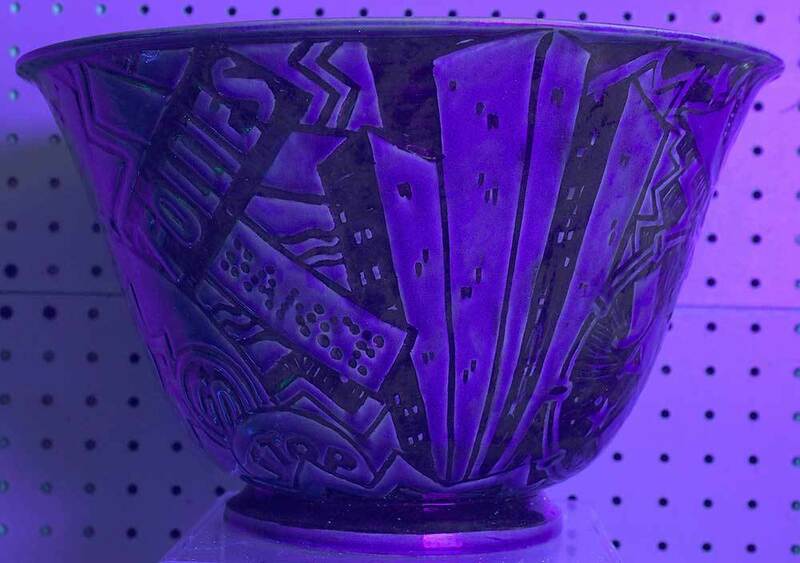 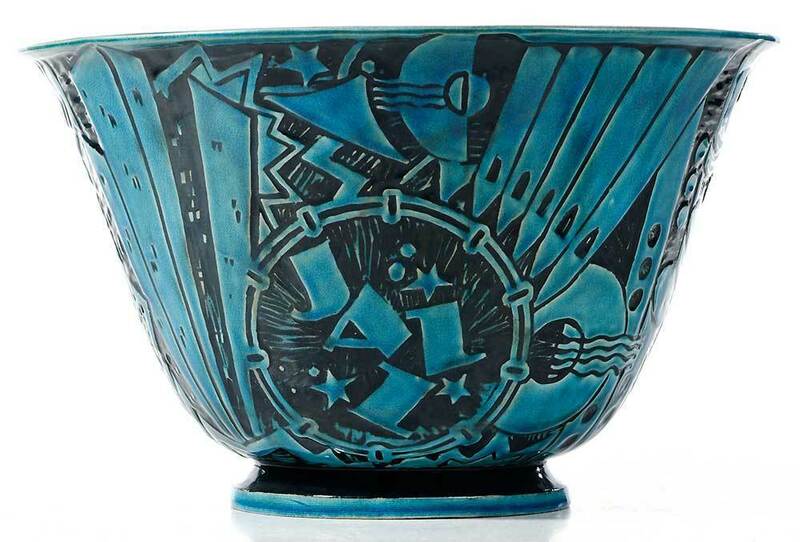 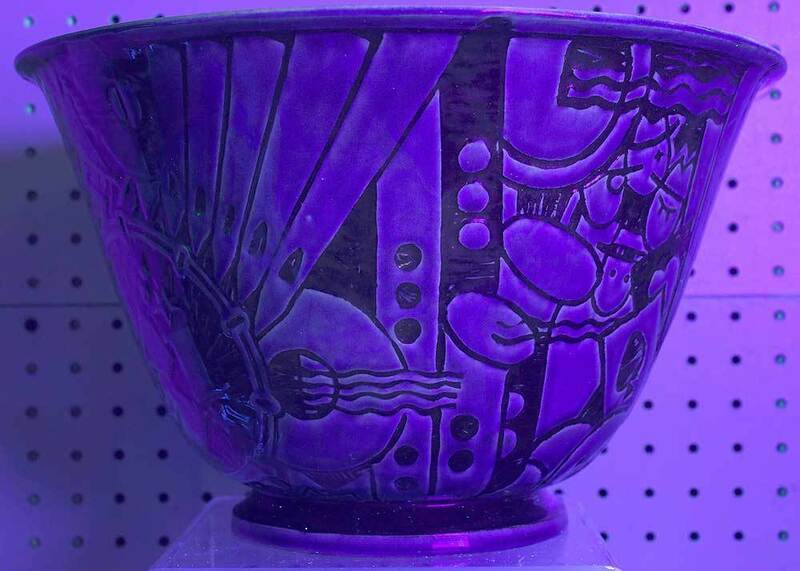 Dubbed the Jazz Bowl series (after the word JAZZ in the design), the bowls capture the nervous energy of urban nightlife and have become regarded as icons of American Art Deco."